Happy Friday and CONGRATULATIONS! Puppy take home day is tomorrow for you families... please verify that the information I have for you is correct below. PLEASE remember- we only accept cash for final balance payments from this point forward because checks will not clear prior to puppies going home. Ms. Orange will be picked up at the farm at 3/30 at 11AM. Final balance will be paid in cash at that time. Mr. Black will be picked up at the Farm on 3/30 at 11AM. Final balance will be paid in cash at that time. Ms. Purple will be picked up at the farm at 3/30 at 11AM. Final balance will be paid in cash at that time. Ms. Yellow will be picked up at the Farm on 3/30 at 11AM. Final balance will be paid in cash at that time. Mr. Green will be picked up at the Farm on 3/30 at 11AM. Final balance will be paid in cash at that time. PLEASE LET ME KNOW IF YOU ARE AT ALL UNSURE OF YOUR FULL BALANCE AMOUNT ($3000-deposit = full balance) OR IF I MADE AN ERROR ABOVE! 3) Remember- puppies LOVE to nibble on shoe laces and human toes. Closed toed shoes are a must! 5) Make sure you are going to the correct address in ASHEBORO! You have been emailed our address. ​6) Please be on time (not too early and not late). Since we do this as a group and many folks are traveling quite some distance to get home, we get started pretty shortly after 11AM. If you are late you may miss some of Puppy Take Home Packet review. If you are REALLY late, I may have to reschedule with you for another date, as Saturday's are often my busiest days. 7) For traveling home... if you can bring a helper to hold the puppy on the drive home we highly recommend it. Though dogs are safer in a crate, we don't really recommend crating for your first ride home simply because it is stressful enough for the puppy and you don't want the first experience with you, the crate, and without siblings to be a negative one. Please bring a towel or blanket for the puppy to ride home on, a lightweight leash, and paper towels (for cleanup if needed... sometimes puppies get motion sickness on the ride home). I look forward to meeting you all! Please call (phone number in email) if you have any problems. Abby's little crew is getting along so well! Everyone did wonderfully at their first vet visit... the only "blip" was that Mr. Green had the teeny tiniest heart murmur (it is graded at a 1 out of 6, though my vet said she would describe it more as a 1/2 out of 6... it is hardly audible). It is not unusual for puppies to be diagnosed with tiny abnormalities at this age. They are growing at a rapid pace, and this sometimes results in awkward phases. We get heart murmurs like this every couple litters or so, and this type of murmur has disappeared with age in every single past circumstance. So, after some discussion with my vet, we both agree that this is something that should not remove him from the selection list and it is very, very likely there will be no murmur by his next 3 week exam. Mr. Green will remain available for selection day tomorrow. You DO have the option to pass on Mr. Green and select another pup, but if he seems like the right fit, we urge you not to bypass him due to this alone. We WILL enhance his cardiac health guarantee. If you are considering Mr. Green and have any questions, do not hesitate to ask. Mr. Green: Green Collar Boy is still the smallest boy in the litter at 2.74 lbs. He is happy and confident, often the first to explore new situations. He loves being picked up and cuddled, and once he has a little playtime he settles happily on a lap. He has a tighter wavy coat, which we know is genetically wavy but may look curly at times if it is allowed to dry naturally after a bath. He makes good eye contact in training sessions. He will do well in any household (family or single person). Ms. Orange: Orange Collar Girl (2.90 lbs) is the QUEEN of playtime! After playtime, she settles nicely and wants to be right in someone’s lap (or at the very least, touching a human in some way while snoozing). She will do well in an active household with kids, with other dogs, or simply with someone who is ready to spoil her and enjoy her precious antics. She loves belly rubs and uses her front feet to swat and bat at toys and siblings during playtime. She is trusting of new people and gives loving kisses and cuddles to everyone she meets! 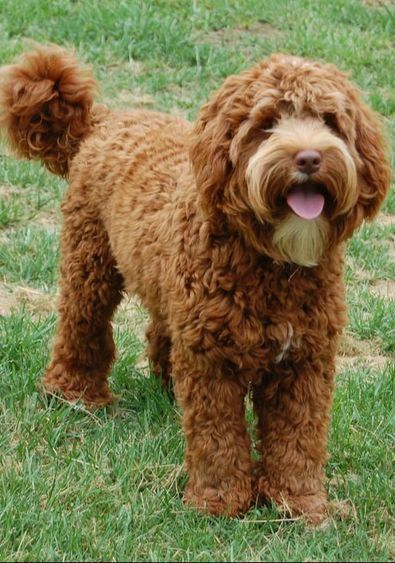 She has a classic wavy coat and has very soft, full bodied hair. This gal is going to bring joy and laughter to a very lucky family who wants a little bitty doodle to spoil! Be careful- she will have you wrapped around her paw in no time. Ms. Yellow: Yellow Collar Girl is middle sized for her litter at 3.02 lbs. She is a super sweetheart, very loving with people. She has a very special, intuitive "look" about her, we say that she has the perfect puppy eyes. She enjoys playing with the adult dogs. She has a looser wavy coat with ringlets on her ears. It takes her a couple minutes to adjust to a very new/energetic setting and bonds closely with “her humans”. She will do well in any household (family or single person), especially with some confidence building (such as with puppy classes). Mr. Black: Black Collar boy is the biggest fella at 3.64 lbs! He has a very stocky/square build, and I expect that he will be in the larger end of the litter weight range. He has a confident, middle of the road personality and a looser wavy coat. He gets excited about food during sitting/manding training sessions and this trait often improves trainability of a dog. He will do well in any household (family or single person). Ms. Purple: Purple Collar Girl is itty bitty at 2.42 lbs. She has a middle of the road personality and is a good combination of playful and cuddly. She has more petite features and is a bit more vocal than her littermates (but can you blame her- she is so small that she has to do something to fend off playful attacks)! She has a tighter wavy coat so as an adult she will look kind of in-between wavy and curly. It takes her a moment to adjust to a very new/energetic settings but at her teeny size, she is doing a fab job! Once she settles in, nothing phases her! She will do well in any household (family or single person). ​A quick update on Purple Collar Girl- we LOVE this gal, and it has been a tough decision but we have decided NOT to retain her for our program as we originally planned. We have to be very picky with who we keep back. At the risk of confusing you here is the reason for our change of heart... we would like to keep back a puppy with a very straight-style wavy coat (like Black and Yellow) rather than a wavier-style wavy coat (like Purple). This is something that non-breeders may never even notice- but like I said, we have to be picky. SO, Miss Purple will now be available for selection, and everyone on the list will be moving 1 spot forward for selection day. Congrats! How did puppy selection day arrive so quickly? Puppies will be going to the vet on Friday the 22nd, and the 7 Week Pupdate w/ temperament testing will be posted that day as well. Selections will take place on Saturday the 23rd. Abby's crew is growing. We will be posting some precious videos on Monday to show off how well they are handling noises and people. They are litter training pretty well for a very small breed pups, with about 80% accuracy with their "aim." We were finally able to add wire racks on top of the litter pan (because they just now got large enough) which will help greatly with keeping the pen clean (whew)! Pups have been weaning this week and are doing great considering that weaning can be tough for little pups. Everyone maintained or gained weight, and they have been chowing down on Life's Abundance dog food. Mommy, Abby, is relieved that she won't have to deal with their sharp little shark teeth much longer, and she is no longer producing much milk. We have a vet appointment scheduled for this bunch on 03/22... one day before puppy selection day! Just a reminder- if you would prefer to pay via CHECK rather than cash in person on pickup, PLEASE mail that in ASAP so that we have it before puppy selection day on 03/23. Mr. Green: 2lb 8oz Mr. Green is ALL fun! He has blossomed into an active, happy and attention seeking little bugger this week <3 He is attentive and focused, and really likes treats. He plays with his siblings and waits right at the side of the puppy pen when someone is nearby who may cuddle with him. Ms. Purple: 2lb 4oz Ms. Purple didn't gain much weight this week- but no worries. This isn't unusual when pups are being weaned, and she will likely gain a little extra this week to make up for it. This sweetie is the smallest in the group and that makes her even more precious that she already is. She really seeks human attention, especially from me! Ms. Orange: 2lb 8oz Ms. Orange- OMG- this sweet baby is full of personality and is simply a blast to sit back and enjoy. She is playful with her siblings and extremely social with humans. She loves cuddles as much as she enjoys playtime. She has a great, thick coat. Ms. Yellow: 3lbs Ms. Yellow is the sweetheart of the bunch. She has really come out of her shell this week and is sweet, sensitive, loving and just a doll. She will kiss your nose while being held and it will melt your heart. She has a beautiful, feminine presence. This has been a big week for Abby's littles... they have expanded into a larger puppy pen with dangling enrichment toys and a 2nd litter box, as well as a crate! They have started spending more time awake, which has made it extra special for us to enjoy their budding personalities. They have begun interacting with calm adult dogs within our pack, which they love, and they socialized with many different people this week. We hope to introduce them to children next week, as well as give them more interesting barrier challenges. They have begun the weaning process and are nursing about 2x a day now, as well as eating solid food. Mr. Green: 2lb 4oz This sweet little boy was a little more reserved this week than last week (a fear period perhaps). He is still so very thoughtful and really analyzes new things with great focus. He enjoys playing with his siblings- but then happily settles down for a nap in a lap. Ms. Purple: 2lb 4oz This itty bitty gal is too cute, she is very petite built with a small frame and face, much like mommy Abby. She is still spunky and enjoys playtime with her litter-mates as well as gentle adult dogs in our pack. Ms. Yellow: 2lbs 6oz This is the larger gal in her litter. She has striking blue eyes (which will turn gold as she ages) and long legs- she is the supermodel pup in this crew! She is middle of the road in this litter- not super outgoing but not reserved either. Mr. Black: 2lbs 10oz The big "dood" in this group, Mr. Black is oh-so handsome and has a sweet personality to match it. He is more outgoing than his brother and is all games when playing. If you see a puppy spinning in circles during play on the puppy cam, it is this guy! These babies are precious! They started on litter training this week and they are doing SUPER! They have been a little behind the curb as far as hitting milestones (not unusual for our smaller litters) however, we have been able to begin adding simply toys to their playpen which they have enjoyed exploring. The "crinkle" toy was the most popular, as it makes a sound when the puppies walk over it, which they found very exciting. Abby is doing great. Pups will begin "puppy mush" food this week. Mr. Green: 1lb 12oz This handsome little guy is the more petite-built male and is super cute! He is very attentive and observes new experiences carefully and thoughtfully. He has great expressions and you can see his "wheels turning." Ms. Purple: 1lb 12oz This little gal is slightly more petite in frame than the others, but she is still spunky and enjoys toddler style playtime with the rest of the crew. Ms. Orange: 1lb 12oz This gal is the comedian of the group, and is the most outgoing. She is always the first to get up and head my way when she sees me near the whelping box. Ms. Yellow: 2lbs This is the largest pup in the litter (not in weight so much as overall build). She is the 2nd most explorer behind Ms. Orange... they make a great team! Ms. Yellow has the cutest caramel nose just like her dad Charlie. Mr. Black: 2lbs This little fella is super handsome with his white markings. He is curious but tends to stand back and let his siblings explore and give him the "okay" before he proceeds. Abby is a fabulous mommy and sure enough these little wiggle worms are starting to peek out and see the world (only a little... but by next week we will definitely see their pretty little eyes). They are wiggling about the whelping box with ease compared to last week and they are growing oh so quickly. Mommy and pups are doing great!